Parents: did you know that if your kids qualify, they could get more time on the SAT and ACT? In fact, up to twice the amount of time if you qualify. Keep in mind, the following steps are only applicable if your student qualifies. Please do not abuse the system and request test accommodations if you truly don’t need it. It is not fair or right. 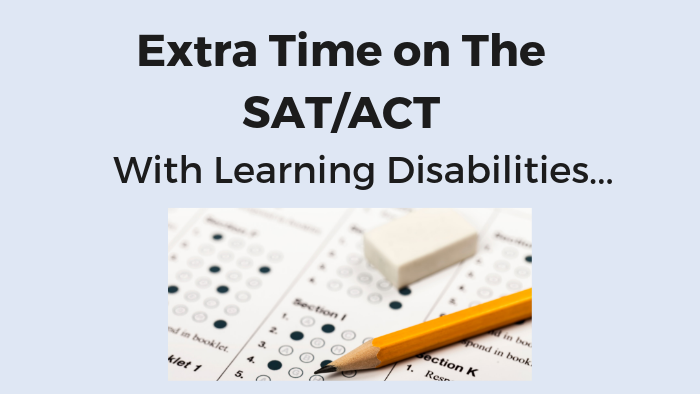 As a past SAT/ACT tutor, I can say that some students need extra time due to documented learning disabilities. This article is applicable to those students. This time advantage can help raise their scores significantly! Some students have even reported raising their score by as much as 350+ points! To be considered your child has to have a documented learning disability and there are several steps needed to be taken to be considered. But if this applies to your child or someone’s child you know, this could make or break their chances of getting into the college of their dreams and obtaining thousands of dollars in scholarships! How much extended extra time can my child get on the exam? It should come as no surprise that having more time on the SAT and ACT can have a significant impact on testing performance. Students can take a deep breath and know that they will not run out of time or feel the pressure of the clock looming over them. As stated above, students who have accommodations can see significant score increases. What does a significant increase in my child’s SAT and ACT scores mean? Since the test makers are not allowed to tell colleges that your child had more time on the SAT and ACT exams, the schools your kids apply to will treat the scores the same way as everyone else’s. This will help your child in three major areas. Colleges put heavy weight on SAT and ACT scores. Although every school is different, it has been stated by Princeton Review that most schools weight the SAT and ACT at about 40% of the college admittance process (with GPA also about 40% and the personal essay / extracurricular activities at only 20%). Private universities typically weight the SAT and ACT score less than state schools but it is still a huge determining factor if your child will be accepted to that school or not! Merit-based scholarships are scholarships strictly given out based on GPA and test scores. In fact, there are 11 billion dollars in merit-based scholarships awarded by colleges each year! They do not take the student’s financial status, race, gender, or any other personal factor into account. Instead, they look only at performance scores. ASU offers a scholarship estimator on its website that shows how much scholarship money your child could get based on unweighted GPA and test scores. As shown in the graph below, an achievable increase of only 150 points on the SAT can secure your kid an additional $18,000 in scholarships to ASU. More time to take the test would make that increase in score even easier to attain. Please see meritaid.com to search a full directory of how much merit-based scholarships your child could receive for his or her GPA and test score combination. There are billions of dollars in private scholarships given out each year as well. Almost all of these private scholarships request the SAT score, so it will still play a key role in winning the award even though private scholarship boards will take other factors into account beyond scores and grades. Higher scores will only help your child’s chances. Sounds great! How do I get my child to qualify? First off, be forewarned: the process of applying for and receiving accommodation is difficult and success is not guaranteed. It has been said that there is no true reason why some students receive accommodation and why others are turned down. Due to the extreme benefits that more time on the PSAT, SAT, and/or AP tests can provide, the testing administrators do not make it easy to receive this accommodation (otherwise, everyone would get extra time!). With that said, if your child TRULY has a learning disability and as at a TRUE disadvantage, then follow the steps below early on, be persistent, and the chances are in your favor. Once again please don’t abuse this system. It is there to help those who are at a TRUE disadvantage. Step # 1: Make sure you son/daughter qualifies. The College Board will need to review supporting disability documentation and states that it needs to meet the College Board’s Documentation Guidelines. The review process takes about 7 weeks from the receipt of all documentation before the College Board makes a determination. Students and schools should submit requests for accommodations early. See Important SSD Dates for specific time frames and Applying for Accommodations for more detailed information on how to request accommodations. When the College Board determines the eligibility of a student for accommodations, your child and the school will receive an “Eligibility Letter.” In it, if approved, your child will get an SSD Eligibility Code to use when communicating with the College Board and when registering for tests, including online registration for the SAT. Most schools have SSD Coordinators, who help students during the eligibility process and help administer College Board tests with accommodations, so talk with your school’s counselors to see what help they can provide. The ACT is commissioned by a different entity than the PSAT, SAT, and AP exams (College Board). Their process at ACT Inc. is slightly different, but they still require documentation. Your child will first need to register for an ACT National Test Date by the registration deadline at www.actstudent.org. Make sure to upload a photo per instructions and print out the ticket. If the application for more time on the ACT is approved, you will receive an email with instructions to print the extended time ticket. Next you will have to complete and sign an Application for Extended Time National Testing and send it in along with a copy of your ticket (from registering in step 1), a copy of your child’s accommodation plan, complete documentation. Apply as early as possible and make sure all they require is submitted, or your child may not be able to test on the date registered. This has been implemented to help those who were born with less fortunate circumstances. It gives students who otherwise would be at a disadvantage the same playing field. It is important for the College Board to have a process and to double check with credible resources to confirm the learning disability exists before giving extra time. Please share with us your obstacles and successes so we can pass it along to others! Proper information is needed and you have mentioned it perfectly. Thanks for sharing and treat each one as they require. Thanks for blog. Keep blogging. how easy to get accomidations for step one I have high anziety what do I need would it help a lot thank you so much!!! Hello! I have dyslexia and I would like to get extra time on the ACT and SAT. If my school doesn’t give out forms to get extra time, should I get the papers for my condition in any physiologist? Yes! I would highly recommend it! I will send you an email with more information as well. My daughter does not have a disability. However, she does have test taking anxiety. She panicks if she doesn’t know the answer, gets distracted by the anxiety and therefore is always the last one to finish a test. She recently toke the SAT and did not complete it. Can She get a doctors/ therapists note stating she has anxiety? Would this be considered a disability. She is not on a IEP and had never been diagnosed with a learning disablitity. I applied for my daughter and got approved for extended time but we faced two major problems: first, the test must be school based and sent to school directly which causes delay in testing date. Second, the test questions on all four sections were not the same as the standard one that everyone took 4 days earlier. Is this normal? Why do they give different tests? They give different test since they are given on different days. They can’t risk a student getting feedback from other students. However, the test are the same in difficulty.